In this article, Professor Burcu Keskin from the University of Alabama will share 7 supply chain trends that working professionals should watch. As pressure to improve supply chain cost performance increases for many companies, the evaluation and selection of competent suppliers become a key concern. Typically, total cost, quality, and delivery performance appear as critical factors in the supplier selection process. However, complex supplier relationships, unreliable sources of material supply, and ever-increasing customer expectations greatly add to the expectations to select the best suppliers and conduct their operations more efficiently. Differentiated customer experiences define the current supply chains. In the past, having one type of product with a long life cycle had been the norm. However, with reduced life cycles, customer-driven innovative products and services have forced supply chains to be flexible and adaptable. The biggest implication of this new imposition on procurement process is that now procurement managers have to deliver suppliers that are cost conscious and timely in their operations but at the same time can adapt to the changing demands of end customers. The way we access the internet has changed rapidly over the past few years, transitioning from computers to tablets, from tablets to mobile devices, and to “everything.” With “Internet of everything” concept expanding, there are more opportunities to connect supply chains and increase the visibility from order initiation to order delivery. Data coming from different sensors located at different suppliers from their production and transportation operations carry a lot of information regarding the quality of the production process and timeliness of delivery. At the same time, this data may indicate possible issues in the procurement process, regarding product quality and delivery. Monitoring and analysis of this data may provide opportunities to intervene before issues become major problems. In the past, many buyers relied on safety stock inventory to mitigate any risks or disruptions to suppliers. However, now with the global supply chains and due to uncertainties over economies, weather, and political situations, new requirements and trends arise to mitigate potential risks. One of these trends, in addition to inventory keeping, is dual/multi-sourcing. Reducing the dependence on a sole supplier is crucial in managing risk. The complexity of supply chains is not a fad that will pass rather, the supply chains continue to evolve into networked economies. Hence, managing complexity has become an accepted fact of managing procurement processes. Analysis and optimization of complexity require a complete understanding of market volatility, fragmented customer segments, globalization, and sustainability. All of these aspects impact procurement processes. 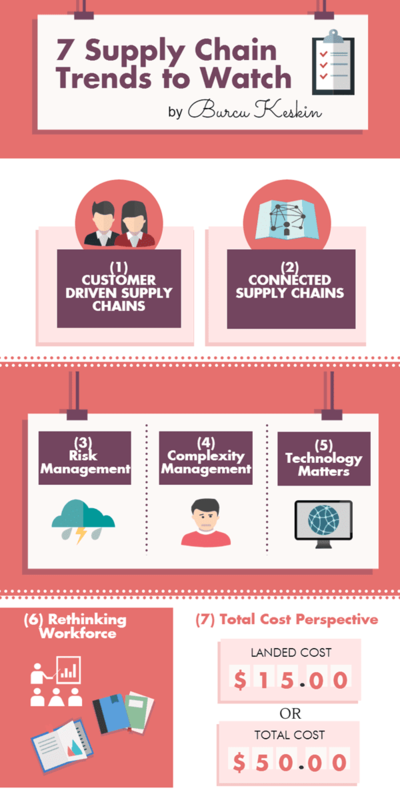 Having a holistic view of information technology offerings for integrating all the supply chain operations, including procurement processes is crucial in the current environment. With connected supply chains and new digital business models, companies need to rethink talent development for successful procurement operations. Unfortunately, the traditional workforce training models do not support current needs. Procurement and supply chain managers that are comfortable with data-driven decision making and have a complete understanding of end-to-end supply chains will be in high demand. Skill gaps will continue to be a challenge for companies. In the past, many buyers selected purely based on the purchase price and quantity discounts. However, when large amounts of products are purchased inventory keeping and management costs are skyrocketed. Therefore, instead of this one-dimensional perspective (procurement price), now buyers have a multi-dimensional approach to consider all dimensions and impact of procurement on other operations (inventory, transportation, handling, etc.) A total cost approach and data-driven optimization to come up with the best plan of action are the desired ways to attack this problem.